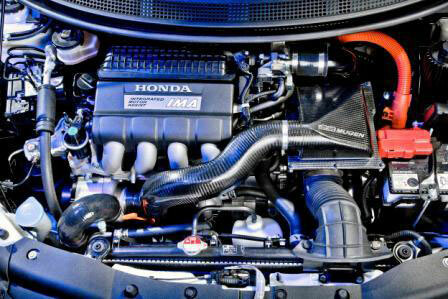 MUGEN Euro’s high-performance CR-Z hybrid will use a supercharger to deliver over 50 per cent more power and torque from the Honda’s petrol-electric drivetrain. The tuned version of the hybrid coupe is expected to produce around 200PS, and 181lb.ft of torque, with significantly enhanced performance throughout the rev range. The car retains the Honda IMA electric motor, and the original 1.5-litre capacity i-VTEC petrol engine, which has been rebuilt to MUGEN specification with bespoke upgraded and strengthened internal components. In order to give a fully integrated and smooth power delivery MUGEN Euro has developed the MUGEN iCF system, which allows all the elements of the electro-mechanical system to work in harmony complementing each other. As well as improvements under the bonnet, MUGEN has used its extensive motorsport and Honda tuning experience to further develop the chassis dynamics, with 5-step adjustable dampers fitted front and rear, an increase in track width and a large reduction in overall weight. Bigger brake discs and 4-pot monobloc callipers help stop the more powerful car, while 17-inch forged alloy MUGEN GP wheels reduce unsprung mass. Elsewhere, the CR-Z gets some cosmetic enhancements in the form of MUGEN body parts, including front and rear under spoilers, side skirts and a rear wing. The Honda CR-Z MUGEN makes its debut at the Goodwood Festival of Speed in July. It is a joint project between Honda (UK) and MUGEN Euro – the Northampton-based subsidiary of Honda’s long standing tuning partner MUGEN. In 2009, MUGEN Euro produced the Civic Type R MUGEN, an extreme, 240PS version of Honda popular hot hatch.